Romain Navarette says he is excited to get stuck into his former club now the Dragons’ form has picked-up. 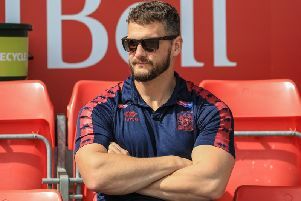 Catalans are unbeaten in their last five games, and sealed their top flight status for 2019 with last week’s win over Salford. And Frenchman Navarette is braced for a battle if Wigan are to head into the Super 8s in the second spot they currently occupy. “They’re coming back good,” said Navarette. Since coming back to Wigan from an end-of-season loan with Catalans last season, 24-year-old Navarette has battled into contention, starting 10 games for the Warriors this term and coming off the bench five times. And although he is relishing facing his former club, he says he no longer feels he has anything to prove. “I’m always excited to play against the Dragons,” he said. “I have some good friends over there, and I’m competitive so I’d like to beat them! I don’t think I’ve got something to prove. my best game it would be good!